That certainly didn't take long. On Friday, with two more bombs turning up (this time targeting Sen. Cory Booker, D-NJ, and former DNI James Clapper), federal authorities arrested the man they say is responsible. He's 56-year-old Floridian Cesar Sayoc, and the paper trail that journalists have turned up says he is both an entrepreneur and a fellow with a long criminal record. That's one of the finest collections of pro-Trump memes extant, including several that feature gun sights superimposed on prominent left-leaning figures, like Hillary Clinton and Michael Moore. 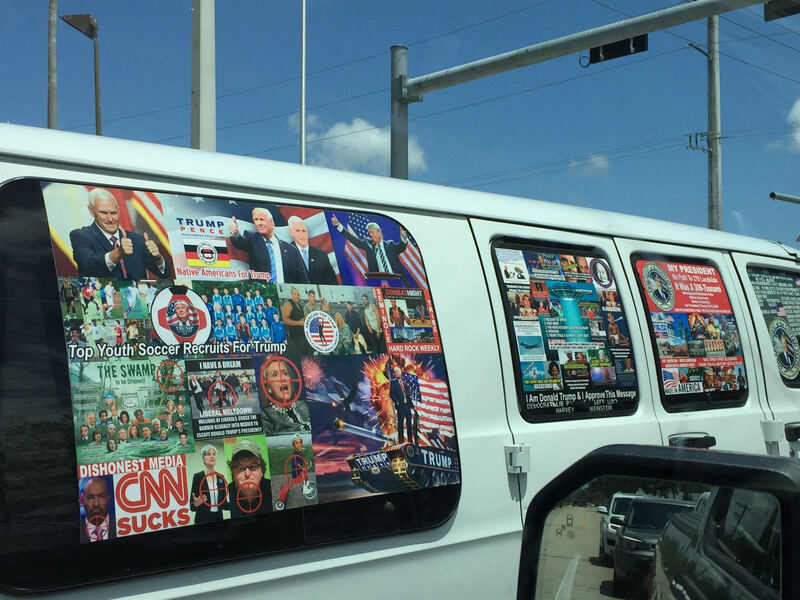 Assuming that the feds have fingered the right man, then it would appear that the #MAGABomber tag was right on target (no pun intended). And the feds surely do have the right guy; they tracked him down with a combination of DNA, fingerprints, and cell phone geolocation information. Meanwhile, since his vehicle just so happens to be a Dodge Caravan, folks are already making the observation that Donald Trump is obsessing about the wrong caravan. And speaking of Donald Trump, his response to the latest developments was...less than presidential, let's say. Any of the presidents 2-44 would almost certainly reach out to any of their predecessors if those predecessors' lives had been threatened. When asked if he planned to contact Bill Clinton or Barack Obama, Trump said, "I think we'll probably pass." Even less admirable was his response when asked if he planned to tone down his rhetoric, given the clear connection between his words and Sayoc's actions. "Tone down, no," he answered "Could tone up. I think I've been toned down, if you want to know the truth." Given how strident he's been in his rallies in the last month or so, in particular using verbiage that brings to mind a certain German leader of the 1930s, it's a frightening thought that maybe he's been holding back. In other words, the situation has taught us a bunch of things we already knew. Anyone likely to be motivated by the response of Trump and his partisans, whether in one direction or the other, already had a thousand other things serving to provide the same motivation. Politico is reporting that Donald Trump is very worried about Florida. The Sunshine State has critical gubernatorial and Senate races, as well as a handful of competitive House races where the Democrats could pick up seats. The situation is so dire that Trump is expected to visit the state twice, as follow-ups to the visits of Mike Pence and Kellyanne Conway on Thursday. Other cabinet members may show up as well. Campaign officials for Gov. Rick Scott (R-FL) and Ron DeSantis (R) say that their candidates are ahead, but their calls for help belie their public confidence. Also, DeSantis fired his campaign manager last month. Candidates who expect to win generally do not fire their campaign managers in the home stretch. Florida isn't the only state Donald Trump is planning to visit in the next 2 weeks. Also on his itinerary are Georgia, Indiana, Missouri, Montana, Ohio, Tennessee, and West Virginia. All but Ohio are states with a critical Senate race (while there is a Senate race there, it's all over but the crying). Ohio (and also Georgia) have bitterly contested races for governor. All of these are states Trump won in 2016, so his visit is likely to be well received, at least by some residents. While the chances of these visits allowing the Republicans to hold the House are low, they could help the GOP expand its Senate margin. Trump will feed red meat to his base at all his stops. The big topics are illegal immigration and the nomination and confirmation of Brett Kavanaugh to the Supreme Court. When Donald Trump was considering justices who might succeed Anthony Kennedy, he had a long list to pick from, many of them with solid records and no obvious skeletons in their closets. Instead, he went with the one guy, in Brett Kavanaugh, that Senate Majority Leader Mitch McConnell (R-KY) counseled against, warning (presciently, as it turns out) that Kavanaugh would be very difficult to get approved. It has long been assumed that Trump made the choice he did because Kavanaugh had a fairly lengthy history of supporting positions favorable to a President who might find himself personally facing the Supreme Court. This week, former speaker and current Trump cheerleader/insider Newt Gingrich confirmed that such suspicions were right on the mark. If and when the Democrats take the House of Representatives, one of the first items on the agenda will be requesting the President's tax returns, a privilege that is granted (statutorily) to the chair of the House Ways and Means Committee (the current ranking member, and would-be chair, is Democrat Richard Neal). Gingrich was asked about what would happen next in this scenario, and he said Trump would refuse, "Then [the Democrats will] be trapped into appealing to the Supreme Court, and we'll see whether or not the Kavanaugh fight was worth it." Many states are making it hard to vote for various reasons. McClatchy has a rundown of the issues and dirty tricks. Here is a summary. Florida: The state bans early voting on college campuses, a rule that is currently the subject of a lawsuit. Having felons get their right to vote back after serving their time is a hot issue, with the voters getting to have a say via Amendment 4. Georgia: Secretary of State Brian Kemp (R), who is running for governor, has refused to recuse himself from managing the election. However, he is actively removing voters from the rolls, especially in Democratic areas (more below). He is also rejecting absentee ballots due to a perceived mismatch of signatures, without giving voters a chance to explain. Idaho: Someone on the "dark web" is selling information about Idaho voters. That is illegal. Also, Idaho cross checks voter information with other state databases and removes voters when it finds inconsistencies. However, even a small state like Idaho has many voters who share a name and birth date with a different voter, leading to voters being purged by accident. Kansas: Secretary of State Kris Kobach is running for governor while supervising his own election. Like Kemp, he refuses to recuse himself from his management of the election. He also arranged for Dodge City to have only a single polling place and it is a mile from the nearest bus stop. Kentucky: Apparently voter information in Kentucky is also available for sale on the "dark web," as in Idaho. It costs $2,000. The Secretary of State, Alison Lundergan Grimes (D), has stated: "The revelation that this data is being peddled on the dark web and could potentially fall into the hands of bad actors greatly concerns me and should every Kentuckian." Mississippi: The state ranks as the most difficult to vote in. It is also openly selling voter data. In addition, there is also a lawsuit pending about whether ex-felons can vote. Mississippi currently prevents them from voting for life. Missouri: The Missouri Republican Party sent thousands of voters false absentee voting information. It said that ballots had to be returned by Oct. 30. The actual deadline is Nov. 6. Voters who weren't paying attention and read the letter after Oct. 30 could conclude it was too late to vote and not bother. North Carolina: Despite a court ruling that North Carolina's congressional districts have been unconstitutionally gerrymandered, the state is not going to change them in 2018. Also, a new state law reduces the number of places voters can cast an early ballot. South Carolina: The South Carolina State Election Commission says it needs $50 million to upgrade and protect its voting systems, but the state legislature is not interested in appropriating it. When voters go to vote, they will be asked for a government-issued photo ID. However, a court ruled that they can vote anyway if they can explain why they don't have one. It is very unlikely that poll workers will explain this to many voters. Texas: In the past, Texas voters have complained of voting machines that flipped their votes. The Texas Republican Party is also pushing hard on the idea that fradulent voting could steal elections, something for which there is not a whit of evidence. Students at Prarie View A & M, a historically black college, have sued the state for not providing any early voting places in their city. Washington: In the liberal Gig Harbor, WA, area, 70,000 voters received a slick mailer saying that Democrat Connie Fitzpatrick, who is running for the state legislature, is not progressive enough and voters should write in the name of a former state legislator, Nathan Schlicher, who is not running. The Republican candidate denies any knowledge of the mailing, which is clearly designed to take votes away from Fitzpatrick. Not only is voter suppression becoming an almost daily item around here, but specifically stories about voter suppression in Georgia are popping up almost every day. The latest, according to reporting from the New York Times, is that 4,700 requests for mail-in ballots have gone missing in DeKalb County. DeKalb is one of Georgia's largest and most liberal counties. It is also 54.3% black. In the past 8 years, a collection of just 11 hedge-fund managers, entrepreneurs, media magnates, and a casino mogul have donated $1 billion to super PACs. Of these, five are Republicans, five are Democrats, and one (Michael Bloomberg) has been a Republican, and independent, and a Democrat. When the Supreme Court issued the Citizens United decision, it said that the possibility of rich donors swinging an election was remote. Turns out it's not. Michigan Debbie Stabenow* 49% John James 42% Oct 13 Oct 22 Michigan State U.